Barrow AFC v Halifax. Bohan Dixon (left). Picture: Lindsey Dickings. Town boss Billy Heath says Bohan Dixon left the club after he was unable to guarantee the midfielder would start every game. 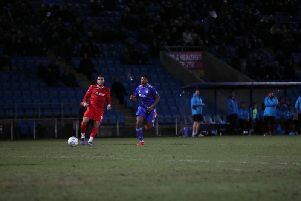 Dixon joined National League North side Stockport this week less than four months after signing for Halifax from Fylde. But he only played four games for Town before leaving the club. “Bohan came to me and said he wanted to play every game, and that’s something I couldn’t guarantee him,” Heath said. Heath said that Dixon’s departure “hopefully” frees up a space in his squad for a new addition, which he suggested could be a central-midfielder. “We lost Michael Duckworth, that’s a blow, because he’s experienced. But I won’t moan about the injuries. “We’ve been playing Josh Wilde at right-back and he’s been outstanding again.